Professional Window Cleaning in South East London. Searching for a expert and affordable window cleaning services in South East London SE? Thomsons Cleaning is just the company you are looking for! We provide professional commercial and domestic window cleaning services of the area at the best window cleaning price in the area. We have been washing the windows of the residents of the area for over a decade. Still the number of our new clients continues to grow with every other year. We have an average of 15K new customers annually. To receive a free and non-obligatory price offer just call us at 020 3746 0000 or send us an online request with a description of the number and type of windows you need cleaned as well as the floor they are located on. Our customer service is available non-stop so you can ask for an offer or free viewing at any time! Thomsons Cleaning South East London SE technicians can clean any reachable window, including: single windows, french doors, double windows, conservatory walls and roofs, skylights, sash windows, bay windows, garden windows, door panels as well as PVC window sills and frames. Upon request we can take out any stickers from your windows too. The specialised window cleaning services we offer are: commercial window cleaning for business buildings, gutter cleaning, patio cleaning as well as conservatory (sun room) cleaning from the inside and out. To get your windows perfectly cleaned, book our certified, fully-insured professional windows cleaning service right away! Thomsons Cleaning has been cleaning the windows of the residential and commercial residents of South East London SE since 2004. We are licensed by Prochem and offer fully insured cleaning services. Our cleaners are all thoroughly vetted, experienced and constantly monitored by quality and safety assurance supervisors. We provide outdoor and indoor window cleaning. The outdoor window cleaning can be done either with telescopic poles fed with purified water, or via rope access. The indoor window cleaning is performed with Prochem certified, absolutely safe and eco-friendly solutions and squeegees. We can clean any windows which are reachable. We offer specific commercial and conservatory window cleaning services as well. 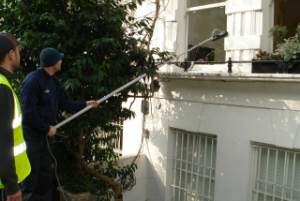 If your South East London SE property windows are located up to the last floor, and there is a parking space for our van within 30 meters from them, then we can utilize the unintrusive, water fed telescopic pole window cleaning method. It is safe for the windows and PVC sills and frames, plus only purified water is utilized for the washing. Purified water is free of any minerals and other sediments, so there is no staining and smudges left after it dries on the glass. Also, by using these poles, our cleaners can wash all your windows without needing to climb on ladders and invade your privacy. This is a quick and very efficient method for window washing. In fact, purified water helps protect the windows from accumulating dust and residues for longer. If your windows are above the fourth floor, we can arrange for one of our trained rope access window cleaners to come and wash the windows manually with the Prochem certified solutions. Indoor window cleaning is performed with the safe and eco-friendly squeegees and solutions. You can combine indoor and outdoor window cleaning and get a discount from the prices! You can book our windows cleaning service or a free viewing in South East London SE for a price quote calculation by contacting our 24/7 customer support center. Contact 020 3746 0000 or send an online booking form here. Within two hours, you will be sent a e-mail and text message confirming the booking. Emergency booking is available. We work 365 days a year. The price is fixed, there are no hidden fees and with no deposit is required. By booking a combination of our services, you will receive serious discounts from their prices. Some of the services which can be combined perfectly with our window cleaning are: carpet, upholstery, gutter, end of tenancy, one-off, after builders cleaning and others. 40% of our customers combine window cleaning with another maintenance or cleaning service. Book your service right now!